You can create blessings in your life, by connecting with the power of love. 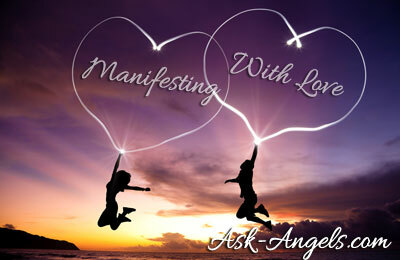 Learn more about this process, and connect with the incredible light and love of the Angels by listening to this new and completely free .MP3 Angel Message from Archangel Uriel! Or keep reading as this angel message is now transcribed for you below. Archangel Uriel assists in cleansing and uplifting your energy… Empowering you to create your reality with love! Simply click the link below to listen, or right click (ctrl click Mac) to save to your computer. Dearest one, indeed, we are here. We your angels are present and I Archangel Uriel speak. Know that in this very moment you are surrounded, you are wrapped, in wings of love. Know that the realm of angels very much exists within your world, simply on a different wavelength… a different vibration. And so for you to tune in to the miraculous joy, love and peace of our angelic vibration, I invite you now to let go of your mind, for your mind cannot enter into this space. Open your heart and tune into your subtle senses, your psychic senses. This is not your normal sense of touch, taste, sight, or smell, but rather more subtle. As you reach beyond the physical into the realm of angels, notice that even reading these words lifts your frequency and has you experiencing in a whole new way. Angels are with you now and we desire nothing more than to love and to serve you. Although you cannot see us with your physical eyes, we see you. Indeed, we angels who are with you now are very focused in your physical realm. Focused on serving humanity. We are your guardians, we are your archangels, and we serve to connect you with more love, for understand that as you open to love, truly your divine path of your highest good opens up to you. Love holds great power, which we angels are aware, and which your realm is beginning to become aware of also. Indeed, the power of love holds great strength and ability to help you to manifest and to create what you want. There is great truth in the law of attraction, which is gaining pace and momentum in your realm… However, what you must understand is that your focus is not the only prerequisite. It is true that what you focus on begins to create. But it is more true that with love, that with love in every moment, with gratitude about what you already have and already appreciate, by loving that which you want and even loving that which you do not yet have, love is the fuel for your ability to create in your reality. This is why we angels are so eager and pleased to help, for we know in our hearts that we are able to help you open to more love. Understand that this love begins with you. If you are looking for love outside of yourself, look no further for even in the most romantic sense, love must first be found within. And so as you open your heart and tune into your inner being, your subtle senses, and the angels that are around you think, “I love you.” Send this love to yourself and if you are sensitive you may note that as soon as you think or speak, “I love you,” your frequency lifts as if you are lifted up and out of the density of your physical realm, out of the challenges and struggles, out of the hardship and pain and with love you are able to lift into the light. Now sit here and just be, as we send you more love, for as you love yourself you automatically attract love from the universe. Since you have proven you are able to love you, we are more than happy to assist in loving you as well. We send frequency, and vibrations of love to cleanse and lift your energy. Allow your heart to open wide and allow the energy of divine love to swirl around, and to be completely present with you here and now. You are so loved and as you love you lift. And as you lift, more and more of your authentic truth, of your authentic power, of your divine birthright, of your highest path becomes known to you. Let love be your guide and you will be led well, for the power of love does not end with you. When you are loving, this love flows out, infuses the collective conscious with light and fine vibrations that the energy of love holds. And what you send, you indeed begin to attract to you also. So as you love those things in your life, as you love the people who you care about, as you love yourself, more and more love is drawn to you. In the form of that which you desire to create, in the form of blessings, and in the form of we angels who are always with you, awaiting your command, awaiting the opportunity to assist in helping you open to more love and more light, to raise in vibration and truly be transformed into the angelic being that you are at your essence and at your core. As you lift, remember to breathe and remember to love, and all your power in the light and in love is made accessible to you. With this energy at your fingertips, you can create that which you want. That which is centered in love will manifest quickly. That which serves all of consciousness will easily flow with your way. Before I leave, there is one more thing… Remember to go with the flow and the right people, places, and situations will be aligned with your path. We angels will make sure of that, one step at a time, and one moment at a time. Choose love, call upon assistance, and together you in the physical and we in the angelic realm are able to bring much joy and love into your experience. We love you. Feel this love of your angels and share this love with others and with all. You are so loved and I, Uriel, leave you with my blessing. This Angel Message is now available in video format as well! you came to me as a blessing from the universe. I’m Learning about all the Archangels and my spirit guides… I’m loving this journey.?? ?